This Easter, the children made their own Easter cards using HTML and CSS. Here are some of the results. There was plenty of creativity during the Easter term. Here is a sample of Scratch projects created by the children. The Bitsbox interface consists of a phone simulator and a text editor, so the results can be seen straight away. A QR code can also be scanned so the apps can run on a phone or tablet. 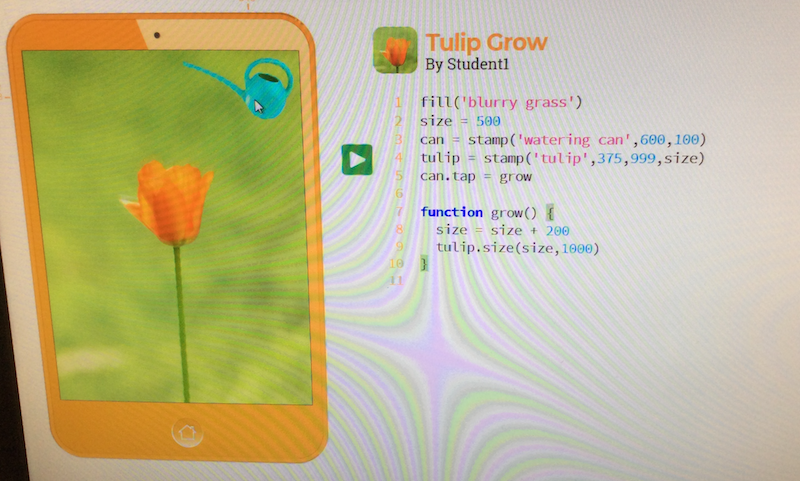 This is a great way to introduce text-based programming to young people. This has to be one of the favourite projects of the term, Year 3s learning how to create stamps with Scratch. This term the children have been using the Scratch Programming environment to create fireworks displays, learn about gravity, make their own Pokemon games and to create maths quizzes. Here is just a small sample of some of their creations. Is the micro:bit the answer to inspire girls into coding? I organised and led a popular Summer of Code last July. We ran a well-attended session on the micro:bit – the electronic device developed by the BBC with the aim to introduce more children to coding. We had a packed room… but only a few girls. The girls who attended the session were particularly keen on the micro:bits. They loved giving it instructions and seeing the displayed results. I enjoyed seeing them actively participating, playing each others’ games and showing me their creations. It became clear to me that the micro:bits are great for introducing girls to coding. They can see how code interacts with the physical world and as their coding skills develop, they can start making their ideas happen. I believe that introducing girls to coding from a young age is so important. Digital literacy is not just for boys and parents need to realise that micro:bits, computer games, Minecraft, etc are part of every child’s digital world. Parents should not make gender assumptions when it comes to computers and electronic devices. The earlier the girls are exposed to technology, the more they will be interested in STEM subjects later on. So here it is a big plea to parents: give your daughter a micro:bit and let her tinker away. Look out for any coding activities in your area where your daughter can participate. The Summer of Code took place for five days at the end of July in partnership with the Curzon Cinema in Clevedon. The event would not have been possible without the generous support of our sponsor, Costain. We organised five different workshops for young people on each of the days. On Monday we had 6 and 7 year-olds ready to learn how to code on their tablets with ScratchJr. This group had never done any coding before – so we gave them an opportunity to learn how to make an animated story. They produced stories involving cats, wizards, ducks, fish, whales… and their very own drawings. On Tuesday we had a room packed with children learning how to make a Minecraft game in Scratch. Even though this was a more advanced workshop and most children already had some understanding on how Scratch works, there were plenty of challenges. The children learned how to get special Minecraft sprites, how to create a list to collect survival tools, how to switch from day time to night time, how to control the main character in their Minecraft world, etc. It was good to see so many variations of the game. Since the workshop, a few parents have told me that their children have spent considerable amounts of time on Scratch at home. On Wednesday we introduced the children to app making using Kano Art. Although Kano is mainly used with the Kano computer, we were still able to use the desktop application. Once the Kano application was introduced to the children through a series of activities, they were able to take on the task of making their own app and the session finished with a ‘show and tell’. Thursday was a real hit: we got out the micro:bits. We let the children set them up, create and download the code and see the results on the micro:bits. We had many ‘wow’ moments and plenty of smiles as they created guessing games, played rock-paper-scissors and drew ‘smiley’ faces. Some children even created their own Pac-man game. On our last day we introduced the children to Python. We chose ‘Tina the Turtle’ to guide the children through a set of activities that involved Tina drawing, moving and receiving commands. There was so much to cover that we ran out of time, but I hope to build on these Python activities next time. I’m so grateful to my colleague, James Irwin, who joined me at the Summer of Code every single day to give a helping hand when needed. He is a STEM ambassador and total star. Thank you, James. The Curzon cinema in Clevedon continues to support us with our mission to get more young people into coding. A big thank you for the fantastic support and all the work they put into the event to make it happen. If your child was at any of the workshops, we would love to hear whether they have continued to use any of the programs we covered at the Summer of Code. Please do send your feedback. We plan to return next year with a third Summer of Code. During the last term of the school year, I ran five sessions on how to program the micro:bit at Yatton and Mary Elton primary schools. The micro:bit is an electronic device created by the BBC to encourage children to code. The BBC distributed micro:bits to secondary schools in 2016; since then the micro:bit has grown in popularity and it is now available for anyone to purchase for their own use (for less than £20). I got my hands on a micro:bit as soon as it was available with a view to introducing it to primary school children. I then bought a further 10 micro:bits – enough for twenty children to work in pairs. The devices have been fantastic and the children have loved programming them. The children were challenged to display letters, numbers, play games, build a compass, check the temperature and listen to music notes. I was pleased to see the children’s enthusiasm; it was like ‘a pet’ that obeyed their orders and commands. It made them laugh and they loved going around the room sharing with their friends. The micro:bit is not just for secondary school children. As more children become more confident with coding, they are ready to be challenged, and the micro:bit is the perfect device for this. It is easy to set up and get started. I look forward to running more micro:bit sessions in the next academic year and continue to challenge the children. Teaching ScratchJr to Year 1 and Year 2 children has been a particularly rewarding and challenging experience this past academic year. When the children start learning to code at such a young age it is important to keep them engaged and interested. ScratchJr has been fantastic in providing the levels of engagement the children need while at the same time nurturing their creativity. ScratchJr has all the basic elements of a design tool to draw characters and backgrounds, which is perfect for young creative coders. It also comes ready with a set of characters and backgrounds from which to draw – and the children love using a combination of both. At every session I see ideas come to life with beautifully-drawn characters, backgrounds and ‘abstract’ drawings (use your ‘imagination’)! Although the coding blocks that come with ScratchJr are pretty basic, there is so much to learn and it takes time for the children to master the concepts. Year 1 – the children learn basic algorithms; how to give instructions to their characters to make them move, rotate, dance, etc. In computer programming, this is called ‘sequencing’. Year 2 – the children learn more complex algorithms. They start making small games and use computational thinking in their thought process. In Year 1 and Year 2 the children learn to identify ‘bugs’ in their code and how to ‘fix’ them. They also learn to collaborate by helping each other and explain how they solve their coding challenges. In order to for the children to advance their understanding of coding, I also introduce them to the fantastic resources of Code.org which help reinforce their understanding of computer programming concepts. We always try to allocate time to ‘show and tell’ at the end of each session. This academic year has been another big success. Special ‘thank you’ to parents for encouraging their ‘little ones’ to code. Here are some of the children at work and some of their work. During the half-term I ran a workshop about ‘Getting started with micro:bit’ – an electronic device created by the BBC to get children coding. The session was a couple of hours long – enough time to cover all the basics and for the children to write their first programs. All the children had the opportunity to get setup with a micro:bit. Seeing the childrens’ smiles as their first ‘Hello World’ program displayed on the micro:bit was a great moment. Once the children understood how to download their programs to the micro:bit and test them, the tinkering and the fun started. We took advantage of the micro:bit accelerometer and created a ‘guess-the-number’ game, which was played by shaking the micro:bit. The children *loved* shaking the micro:bit and seeing the results on the display. Tinkering with the micro:bit is a great way to get young people into coding and understanding about the connection between the code and its interaction with the real world. As always, thanks to The Curzon Cinema in Clevedon for hosting us.